The Haryana Chief Minister, Mr Om Prakash Chautala, today charged the Centre with pursuing a “pro-capitalist” policy and demanded that the credit policy of banks be tilted in favour of farmers. The Punjab Chief Minister, Mr Parkash Singh Badal, on his part asked the Union Government to provide one-time Central assistance of Rs 200 crore to eliminate non-performing assets of cooperative banks in Punjab. Were Members of Parliament justified in raising their pay three-fold? Punjab Chief Minister Parkash Singh Badal and Haryana Chief Minister Om Prakash Chautala at the Chief Ministers conference convened to deliberate on a task force on the cooperative credit system and the Rural Infrastructure Development Fund in New Delhi on Saturday. A Delhi court today sentenced to death a Sikh militant for exploding a car bomb near the Youth Congress office here in 1993, killing nine persons and injuring 29, including the then YC President M.S. Bitta. Fourteen persons, including five militants, a couple and the kin of a National Conference leader, were killed and four wounded in Jammu and Kashmir, where security forces arrested two militants and recovered nine kg of RDX since last night, an official spokesman said today. EDIT: Tehelka expose: how relevant is Lakshman rekha? The coordination committee meeting of the BJP-led National Democratic Alliance government on Monday is expected to discuss ways of dealing with the tehelka.com expose in a bid to rally round former Union Defence Minister George Fernandes. The bigamy scandal of Mr Prafulla Kumar Mahanta had its first casualty when the BJP today announced the severing of electoral alliance with the AGP in Assam. Yeh hai London, yeh hai London, meri jaan! The Chief Security Officer in the Naval Armament Depot of the Eastern Naval Command headquarters here was today arrested on the charge of spying for Pakistan’s ISI agency. The Punjab State Electricity Board Chairman, Mr G.S. 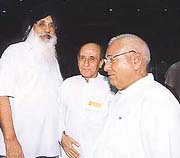 Sohal, having met the Chief Minister, Mr Parkash Singh Badal, in New Delhi, has proceeded on leave. The five-year-old defamation case against Mr Shanta Kumar, Union Minister for Consumer Affairs, concluded on a happy note today when he and the complainant, Mr Virbhadra Singh, Congress leader and former Chief Minister, arrived at a compromise in a court. Mr Shanta Kumar and Mr Virbhadra Singh after reaching a compromise.